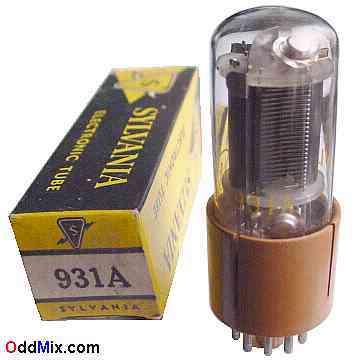 This is an original Sylvania 931A Photomultiplier tube. This tube has nine stages and a 1,000V anode supply. It has an S4 Spectral Response and a Luminous Sensitivity: 20 a/lm. Most of the 931A tubes were made by RCA or GE. This Sylvania tube is a rare, hard to find, classic eleven pin tube. This detector tube is useful in spectroscopy, astronomy, nuklear radiation detection, many older instruments and special measuring circuits. Useful as a technical collectible, for instrument restoration projects or to set up a private vacuum tube museum. This is a NOS (New Old Stock) is unused, boxed, in excellent condition. One available. First come first serve.